I've mentioned before on the blog that I did not become a fan of seafood, specifically fish, until later in life. 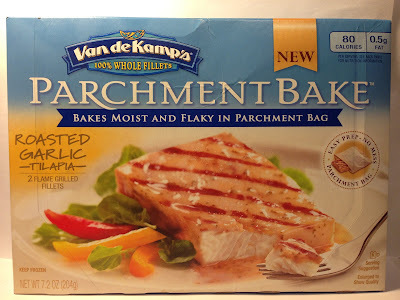 For the purposes of this blog, I've only reviewed Gorton's frozen fish products and I've even reviewed the same flavor as this Van de Kamp's ParchmentBake Garlic Butter Tilapia. Because of that, I'll be able to draw a comparison as to which company puts out a better product in this flavor. For the price and nutrition hounds out there, I picked up this box at Meijer on sale for $3.99. There are two frozen fillets per box and each fillet comes in at roughly 3.6 ounces with 80 calories and fourteen grams of protein. From the outset, this Van de Kamp's product differs from Gorton's product as this one is a ParchmentBake, meaning that they want each of these individual fillets cooked in the bag that they come in. That's a French style of cooking called "en papillote" which very easy translated means, "in parchment" and cooks based on the premise of steaming the contents. So, that adds a little different element to this which, depending on the excitement level in your life, could be find of fun. The fillets themselves frozen in the bag have "pre-grill" marks and then a layer of butter and garlic for the product name portion of this. The garlic and butter smells are quite strong, so based on that, I was expecting strong flavors of butter and garlic in my fillet. Although, I will note that this seemed like a lot of butter, so I'm not quite sure how this could be only 80 calories with that much butter, but as I've said before, I'm nowhere near a food scientist. The pic above is what the tilapia fillet looks like after I cooked it "en papillote" for the prescribed 24 minutes in the oven at 400 degrees. 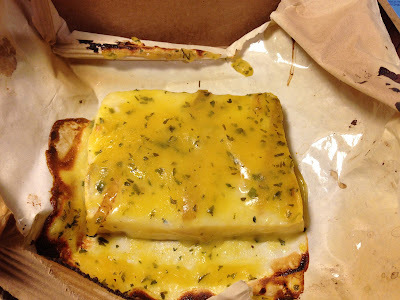 The butter melted slightly and seeped down into the fish to make it even more juicy. One thing I will note is that this fillet had more of a fishy smell than it's Gorton's competitor and being that fishy smell is a big turn-off to me, I wasn't exactly excited about that. Another note is that the butter layer on top of the fish almost retained a gelatinous-like characteristic and didn't melt nearly as much as I expected it would. It looked like a piece of cheese. I don't know if it was because it needed to cook longer or what, but it was just weird. Visual appearances aside, I took my fork into the fillet and was met by a nice mix of garlic and butter flavor along with a somewhat more fishy than I'd like fillet. The fillet was a bit tough and not as juicy as I would have liked and tended to be a bit chewy, but it wasn't anything that ruined it for me. I would have expected cooking it in the parchment would have made it exceptionally juicy, but it seems as if that really didn't deliver. All in all, the garlic and butter delivered strongly and took over for the weak flavored tilapia. Buy It or Fly By It? Looking at this product alone, I would give it a BUY IT rating. It certainly wasn't great, but it wasn't bad and if frozen fish is your only option, this isn't too bad (obviously fresh is always better). When comparing this to the Gorton's version as I said previously that I would, I would purchase the Gorton's version before I purchased this one as it delivers on a little better flavor and juiciness. The only reason to choose this over that is for the novelty of cooking the fish in the bag, but in my mind, flavor should always win out over novelty. Pretty detailed review you've got going on here. Being from the east coast, I always go for fresh seafood but I could see going for something like this in a pinch. Yep, fresh is always preferred, but this is good in a pinch. Also, in the midwest, fresh isn't always available so having a semi-decent substitute is always a good thing. Thanks for the comment! I hated fish all my life up until very recently too (although as a child I did like shellfish such as shrimp, crab, etc.)... then wouldn't touch any kind of seafood at all for most of my adult life. Now I'm just starting to like fish for the first time. I still hate salmon though... I don't think I will ever like salmon. 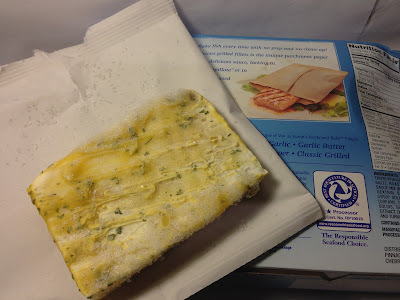 I doubt I would go for this particular product since I don't care for having my food drowned in butter (another thing I don't think I will ever like), but it's pretty impressive how far frozen fish and seafood have come; not too long ago, all you could get were fish sticks and battered fillets. I'm very similar to you. I stayed away from ALL seafood up until the past eighteen months or so and have been gradually working my way into liking it. These frozen products, while not ideal, are at least allowing me to find out what I do and do not like and also allowing me to not break the bank from buying fresh (expensive) stuff in the process.